The short stories in Disturbing The Beast boast breath-taking prose and thought-provoking plots. The book is produced by Boudicca Press, a new imprint showcasing the work of leftfield female literary talent. The collection smashed its target on Kickstarter, and now you can hear those stories up-close and live – and buy a copy of the book on the night. Rosie is a novelist, poet and member of Goth-inspired band The March Violets. her latest book is The Night Brother, a tale set in dark 19th-century Manchester. You may also know her as Rosie Lugosi The Vampire Queen – and as the new writer-in-residence at Manchester’s historic John Rylands Library. Sam is the author of The Quiddity of Will Self and co-founder of independent publishing company Dodo Ink. Her journalism and essays have been published in The Guardian, The Independent and The Weeklings. She’s also a freelance editor and is working on her new book, The Fragments of My Father, due out in 2020. Abi is a fiction writer who was shortlisted for the Bath Novella-in-Flash award. She has also written for TV, theatre and film, founding theatre and film company Faro Productions and cabaret collective First Draft. She has also has written for LGBT History Month and is a graduate of Channel 4’s 4Screenwriting programme. Bad Language is Manchester’s leading spoken word night whose recent featured performers have included Jess Green, Shirley May and Beth Underdown, Feminist Book Fortnight is a celebration of feminist books with over 50 events taking part in bookshops across the UK. Wednesday 8 May 2019, 7pm at Blackwell’s Bookshop, University Green, Manchester. Book your free tickets here. Venue details here. Join our Facebook event here. Remembered tells the story of Spring, an emancipated slave, who is forced to relive a haunting past in order to lead her dying son home. The book also won a Northern Writers’ Award. Open mic spots for this month’s Bad Language are available from Wednesday April 10th. As ever, read the roolz then pop us an email (details here)! 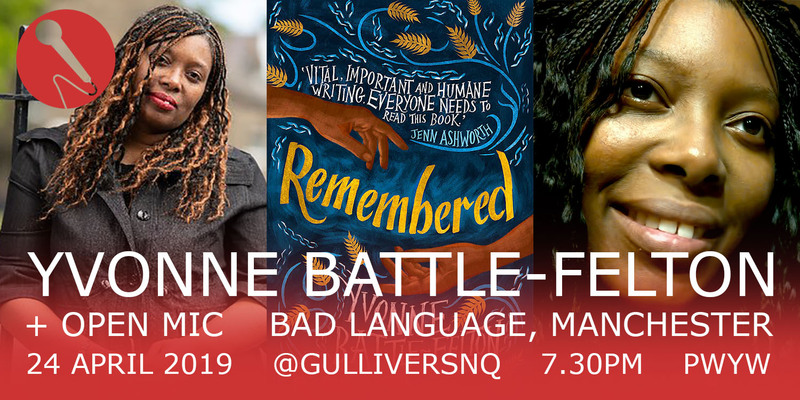 Wednesday 24 April 2019, 7.30pm at Gullivers, Oldham Street, Manchester. Admission: pay what you feel – donate to this event in advance here. Venue details here. Join our Facebook event here. Announcement: Hey! Open mic spots for this night are now available! Read the roolz by clicking here, then get in touch asap. 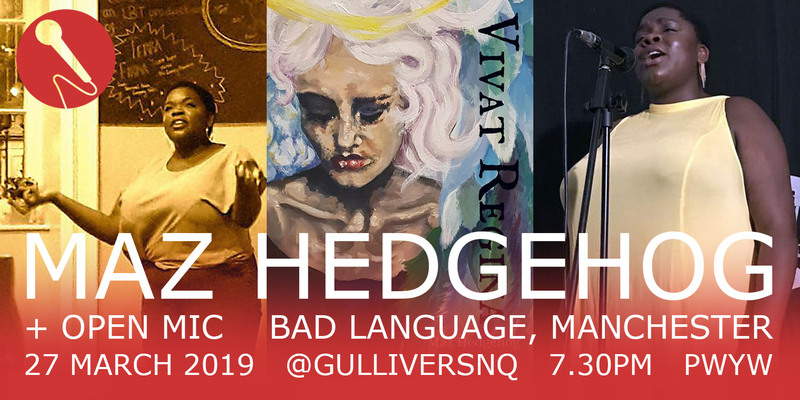 British fantasy poet Maz Hedgehog will headline Bad Language on March 27th, as she releases a new book inspired by John Keats and Neil Gaiman. Maz is a spoken word poet and performer whose debut collection of original poems, Vivat Regina, takes on conquest and duty and freedom and flowers and fairies. The book, released on Superbia Books, evokes the English epic poem The Faerie Queene by Edmund Spenser, while also asserting the place of black queer perspectives and viewpoints within British cultural identity. Expect magical beasts and beings – and a wonderful set of performers to join Maz on March 27th. On Sunday March 10th, we will release ten open mic spots for this event, with at least five spots reserved for those who haven’t read with us before. Look out for the announcement, and be quick to email when it appears! Wednesday 27 March 2019, 7.30pm at Gullivers (opposite The Castle), Oldham Street, Manchester. Admission: pay what you feel – donate to this event in advance here. Venue details here. Join our Facebook event here. Ralph Dartford presents a brand-new spoken word story about England, people trafficking, addiction, the causes of addiction, and the recovery from its destructive forces. 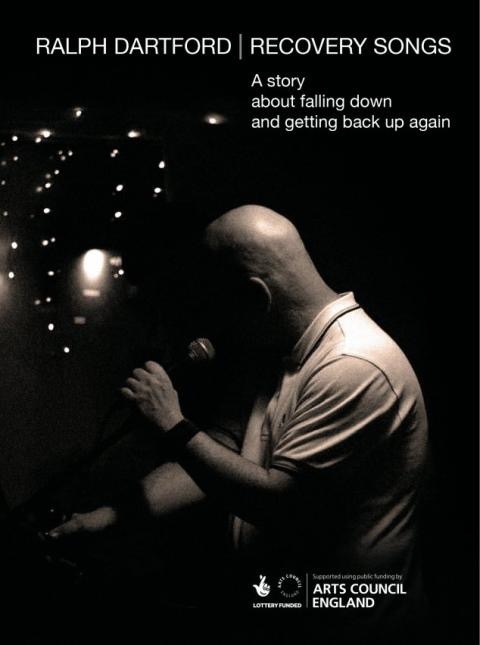 Written and performed by A Firm of Poets founder, Ralph Dartford, and based on his own true experience of addiction. An unflinching, sometimes funny confessional that might change your mind about everything you thought you knew about addiction. Ralph’s work has appeared in the Guardian, Pulp Faction, Stirring (US), Word Life and London Territories amongst many other publications. His first volume of poetry, ‘Cigarettes, Beer and Love’ received wide acclaim, and his second, ‘Recovery Songs will be published in autumn 2019. Thursday 23 May 2019,7.30pm. The Castle, Oldham Street, Manchester. Advance ticket donation: £5. Venue details here. Join the Facebook event here. Bad Language is back with a wellie full of wordsmithery at the Northern Quarter’s top tavern of tomfoolery Gullivers. Join us on Wednesday January 30th for our first event of 2019. Our headliner will be multi-award winning Irish spoken word poet Ciarán Hodgers. He won Manchester’s influential Word War slam in 2017. He also scooped the Sean Dunne Young Writers Award and the International Pangaea Poetry Slam, and was billed as one of Lingo’s 2016 ‘Powerhouse Poets at the top of their game’. Georgia Cranstone! Hannah Clark! Jack Greeney! Meron Berhanu! Miles Hadfield! Robert Steventon! Rory Dickinson! Scarlett Ash! Siobhan Hoy! Tom Ainsworth! For 2019, we have brand new hosts! We’re delighted to welcome rising stars Fat Roland and Joe Daly as comperes– wait, that’s the same old hosts. They’re rubbish. I’m not coming if they’re going to be there. Pfffrt. Wednesday 30 January 2019,7.30pm at Gullivers (opposite The Castle), Oldham Street, Manchester. Admission: pay what you feel. Venue details here. Here’s the Facebook event. We are hugely excited to announce SHIRLEY MAY as our final headliner of 2018. Shirley is the director of Young Identity writing collective, which does amazing work with teens and young adults. She has performed nationally and internationally, including the Nuyorican Poets Cafe in New York and the Calabash writing festival in Jamaica. Her debut collection SHE WROTE HER OWN EULOGY (Wrecking Ball Press) is largely inspired by her family’s history and is a deeply emotional and often lyrical collection. It might still be worth seeing if there are open mic spots available for this month: email openmic@badlanguagemcr.com. Our open mic line-up will be announced soon. Wednesday 28 November 2018, 7.30pm at Gullivers (opposite The Castle), Oldham Street, Manchester. Admission: pay what you feel. Venue details here. Here’s the Facebook event.